Learn just what the typical tuition is for U.S. schools, and how Bryan University compares. Be prepared economically for your education. Contrast Bryan University's tuition and fees to typical schools. Look for tuition trends and increases to find out whether you must devote more resources for the following 4 years of college bills. For nationwide, regional and statewide comparisons, view the table below to find out how Bryan University compares to other colleges. Full-time undergraduate students at Bryan University paid $15,400 in fees and tuition in the 2017 - 2018 academic year, before modifications for financial aid. $13,810 was the price tag on tuition. The other $1,590 are added fees. Unfortunately, this college doesn't offer any tuition discounts to residents of the state. The tuition and fee costs cited on this page don't include room and board, which can increase your expenses. Keep in mind a lot of students will get financial aid and scholarships that decrease their total cost. View the table below to find 2017 - 2018 school year costs. How much does Bryan University cost part time? 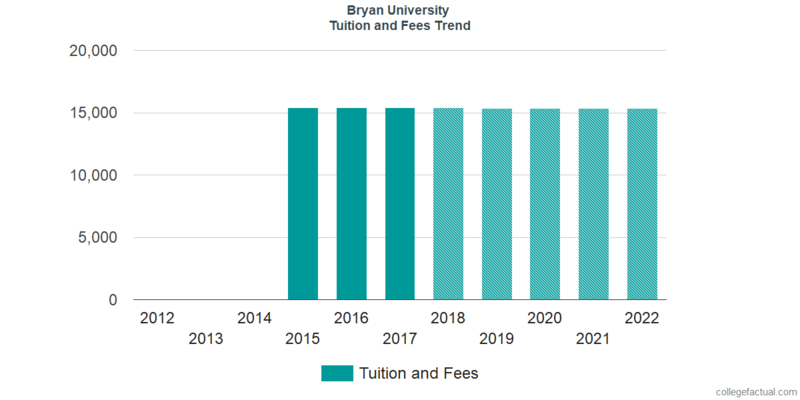 Tuition and fees at Bryan University have stayed stable in the last 5 years. We predict the price tag on fees and tuition for this year will be $15,386. If tuition charges continue to remain stable, two years here will cost you $30,758 and four years will cost you $61,462. In addition, you will probably have added expenses such as room and board, books and, transportation. Look at this next chart to discern how Bryan University fees and tuition may increase in the years to come. Mainly due to the cost of living as well as other variables, the cost of college is likely to increase each year. For this reason your last year of school will be much more than your first year.